WERFORU Leather Ratchet Dress Belt for Men Perfect Fit Waist Size Up to 44" with Automatic Buckle | What Should I Say? 1. The Size of This Belt - Total length 130cm, strap width 3.0cm. After receiving this belt, please cut it down to get right size. 2. New Style Buckle - Feel the innovation and the technology convenience with your waist. Quite easy to tighten and release. 3. Material - The Strap of this Belt is made of top grain genuine leather, quite soft, durable and sturdy. The buckle is made of Zinc Alloy, shiny and practical. Only good raw materials can create a great product, you will like this belt for its quality. ✦ Suitable Size - The total length of this belt is 130cm (excluding the buckle), suit for 28"-44" waist. With 34-position ratchet track system to get perfect fit wearing experience. 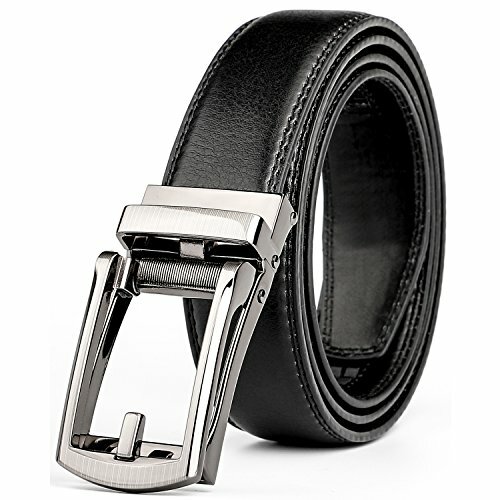 After receiving this belt, please try on this belt and shorten it with a pair of scissors to get your desired length. ✦ New Technology Buckle - New effortless solution with brand new innovation. How to use: Slide in the strap to tighten and the belt auto locks. Lift the buckle and pull to release. Quite easy to tighten and release. Special designed for men in dress suit, uniform and jeans. ✦ Good Raw Material to get Great Product - The Strap of this Belt is made of high-grade leather with texture, quite durable and sturdy beyond your imagination. The innovative new style buckle is made of Zinc Alloy, shiny and practical. The buckle will not fall off or get slipping after long time use. Only good raw materials can create a great product, you will like this belt for its quality. ✦ Fantastic Gift Box - This fashion belt is enclosed in a sleek and modern gift box, which can offer you a quite good gift-giving experience. It is a great gift for boyfriend, father and male colleagues as birthday gift or anniversary gift. If you have any questions about this product by WERFORU, contact us by completing and submitting the form below. If you are looking for a specif part number, please include it with your message.